When a man with a pistol meets a man with a Winchester, you might say that the one with the pistol is a dead man... unless his pistol is Volcanic! In the wild west, the Outlaws hunt the Sheriff, the Sheriff hunts the Outlaws, and the Renegade plots in secret, ready to join one side or the other. Before long, bullets start to fly! Which gunmen are Deputies, ready to sacrifice themselves for the Sheriff? And which are the merciless Outlaws, looking to gun him down? 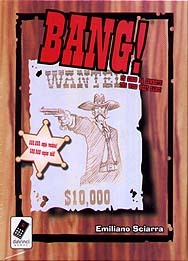 The world's best-selling wild west card game is back in a new, richer format. Easier to learn and play than ever before!